QNAP, Inc., as its brand promise “Quality Network Appliance Provider“, aims to deliver comprehensive offerings of cutting edge network attached storage (NAS) and network video recorder (NVR) solutions featured with ease-of-use, robust operation, large storage capacity, and trustworthy reliability. QNAP integrates technologies and designs to bring forth quality products that effectively improve business efficiency on file sharing, virtualization applications, storage management and surveillance in the business environments, as well as enrich entertainment life for home users with the offering of a fun multimedia center experience. Headquartered in Taipei, QNAP delivers its solutions to the global market with nonstop innovation and passion. Founded in 2004, QNAP has excelled at hardware design and software engineering, and brought to market numerous remarkable technologies and products ahead in the industry. Network-attached storage (NAS) is a file-level computer data storage server connected to a computer network providing data access to a heterogeneous group of clients. NAS not only operates as a file server, but is specialized for this task either by its hardware, software, or configuration of those elements. What is NAS use in business and the market today? As of 2010 NAS devices began gaining popularity as a convenient method of sharing files among multiple computers. Potential benefits of dedicated network-attached storage, compared to general-purpose servers also serving files, include faster data access, easier administration, and simple configuration. 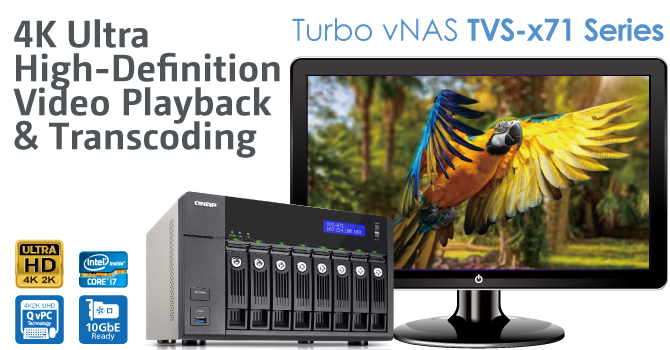 You can view more QNAP related videos [HERE]NAS systems are networked appliances which contain one or more hard drives, often arranged into logical, redundant storage containers or RAID. Network-attached storage removes the responsibility of file serving from other servers on the network. They typically provide access to files using network file sharing protocols such as NFS, SMB/CIFS, or AFP.